Win Passes To A Free Screening Of 'Suicide Squad'! 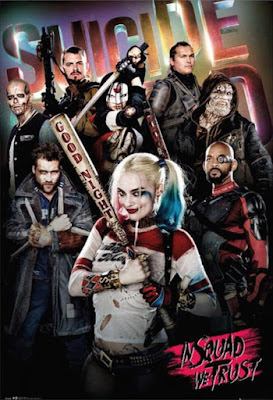 We are happy to offer our readers the chance to attend a free screening of David Ayer's Suicide Squad, starring Will Smith, Margot Robbie, Jared Leto, and more as DC's baddest villains! SYNOPSIS: It feels good to be bad… Assemble a team of the world’s most dangerous, incarcerated Super Villains, provide them with the most powerful arsenal at the government’s disposal, and send them off on a mission to defeat an enigmatic, insuperable entity. U.S. intelligence officer Amanda Waller has determined only a secretly convened group of disparate, despicable individuals with next to nothing to lose will do. However, once they realize they weren’t picked to succeed but chosen for their patent culpability when they inevitably fail, will the Suicide Squad resolve to die trying, or decide it’s every man for himself? The screening takes place on Tuesday, August 2nd at 7:30pm at Regal Majestic in Silver Spring. If you'd like to attend, simply complete the Rafflecopter contest form below. Winners will be selected and notified by email on Friday, July 29th, so get those entries in now. Suicide Squad opens on August 5th!